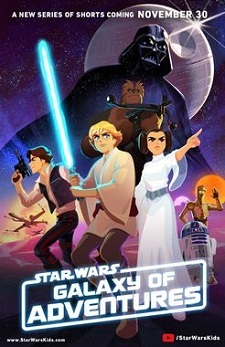 Star Wars Galaxy Of Adventures is a micro-series that retells key moments from the Star Wars franchise in bite-sized, animated form. The kid-oriented series debuted on StarWarsKids.com and YouTube on November 30, 2018. 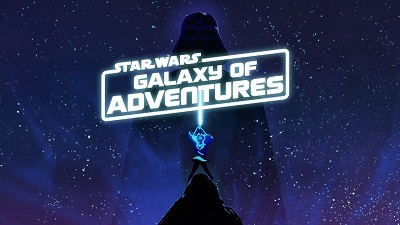 It is the kickoff to the Galaxy Of Adventures brand and a year-long storytelling initiative that will culminate with the release of Star Wars: Episode IX. Its aim is to introduce the classic themes, pivotal moments, and iconic characters from the Star Wars saga to the next generation. A terrific mix of old and new music, the amazing score of the series was made by Emmy Award and Grammy Award-nominated composer, songwriter, music director, and conductor Ryan Shore, who scored the first series of that kind, Star Wars: Forces Of Destiny. Rayan’s 60+ scoring credits include Julie’s Greenroom (Netflix, starring Julie Andrews with all new puppets from the Jim Henson Company), The Legend Of Muay Thai: 9 SATRA, Penn Zero: Part Time Hero (Disney Television Animation), Scooby-Doo! WrestleMania Mystery (Warner Bros), Scooby-Doo! And WWE: Curse Of The Speed Demon (Warner Bros), R.L. Stine’s Monsterville: Cabinet Of Souls (Universal), SpyHunter (Warner Bros), and many more. A familiar of big orchestras, he has conducted orchestras around the world in recordings and concerts including The New York Philharmonic, The Hollywood Symphony Orchestra, The Skywalker Symphony Orchestra, and The Czech Philharmonic, as well as conducting concerts for Pokemon Symphonic Evolutions and Soundtracks Live!, featuring music from Star Wars: The Force Awakens. 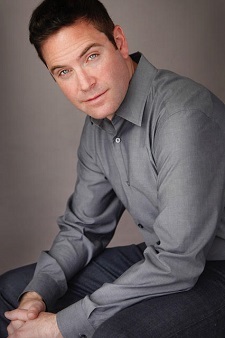 A versatile musician, Shore’s Broadway and theatre credits include orchestrations and arrangements for Broadway concerts starring Tony Award winners Sutton Foster, Idina Menzel, Whoopi Goldberg, Matthew Broderick, Kristen Chenoweth, Heather Headley, and Faith Prince, as well as music directing the Los Angeles production of Heathers: The Musical, directed by Andy Fickman. AnimatedViews: What is your personal relation to the Star Wars franchise and to John Williams’ music in particular? Ryan Shore: I grew up watching the Star Wars films and I’ve been a fan of the franchise and John Williams’ iconic Star Wars music for as long as I can remember. John Williams has been and continues to be one of my biggest musical heroes. He has the complete musical package — from his abilities to compose impactful and unforgettable themes, to his brilliant arranging and orchestration abilities, to the techniques he uses to record his scores with orchestras. He is a true master among masters. AV: How did you come to work on Star Wars: Forces Of Destiny first, which had relatively the same format? RS: I was recommended to Lucasfilm through my friends at Ghostbot. Ghostbot was the animation studio for Star Wars: Forces Of Destiny, and we had previously worked together on other projects. After scoring Star Wars: Forces Of Destiny, Lucasfilm then asked me to score Star Wars: Galaxy Of Adventures. AV: How different is the Star Wars: Galaxy Of Adventures series? 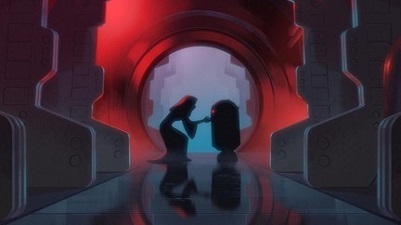 RS: In Star Wars: Galaxy Of Adventures, we are often retelling iconic moments from the films. In that regard, they are very complementary to the films. However, that said, even though we’re retelling many iconic scenes, we don’t always tell them in the exact same way shot for shot, allowing the characters to tell their own stories, and therefore the original recordings from the films don’t always synchronize perfectly. At those times I’ll do my best to utilize the original recordings through creative editing, and then I often compose my own music to weave in and out of John Williams’ music, to create one continuous score where it’s hopefully not obvious where the original recordings begin and end, and where my original music begins and ends. AV: How did you find balance between being faithful and being creative and original? RS: When I’m composing for Galaxy Of Adventures, I’m not actively thinking about how to bring my own musical voice to the series per se, although I’m certain by the very nature of composing that my own voice must come through. Instead, I’m fully focused on how to be faithful to the musical vocabulary John Williams has so brilliantly established for Star Wars. AV: Did you have access to John Williams’ score in order to use his themes? RS: Yes, Lucasfilm provides me John Williams’ original recordings. AV: What did you want to bring personally to the musical universe of Star Wars? RS: When I’m scoring, I do all I can to capture the same feelings I had when I first saw each of the films. I feel if I’m able to do that in a way that resonates with me, then hopefully they will also resonate with audiences. AV: In the editing of the episodes, different moments from different movie episodes can be quoted. How did you manage to keep that whole musical universe consistent anyway? RS: I work very closely with Lucasfilm to ensure we are using John Williams’ themes at the right times and in the right ways. AV: In your treatment of the picture, do you feel more character-oriented or action-oriented? RS: I would say most often I am composing from the character-oriented standpoint, since it is the characters themselves which are living the stories. That said, I do not seek any distance at all to the picture, and instead I do all I can to completely immerse myself within the picture. AV: How did you work with director Barry J. Kelly? RS: Barry and I are in constant communication, and he provides incredible direction. We begin the scoring process for each episode by watching the episode together, talking about what we would like the audience to feel at all the different times, where we would like the themes to be heard, the overall narrative arc of each scene, and the impact of each moment within the context of the greater story. AV: Do you orchestrate yourself? RS: I do. I find when composing music for Star Wars that the orchestrations are very much a part of the compositional process. I usually begin by composing music on the piano. When I’m first composing, I often don’t think much about orchestration at first. Instead, I mostly thinking about much higher level concepts of music composing, such as melody, harmony, arranging, dynamics, pacing, tempo, short notes vs. sustained notes, sounds which are higher in pitch vs. lower in pitch, etc. I feel that if I’m able to create a composition solely on piano that speaks to the picture, then once I orchestrate and decide which instruments will play the music, that the scores will hopefully become more impactful and more dynamic from there. AV: For the recording, you chose the Skywalker Ranch. What do you like in it? RS: The Skywalker Ranch is one of the most special and unique places I’ve ever been. The scoring stage is immensely adaptable in the way that it has been designed. It is possible to change the acoustics of the room by simply adjusting the panels on the walls. When you’re at the Ranch you feel like you’ve escaped to another world where you are completely immersed in a creative environment and are able to focus completely without distraction on the music you’re creating. AV: What size of an orchestra did you use? Did you conduct it? RS: I always conduct my own scores. I compose the music for Star Wars for a full-sized symphony orchestra, which would be roughly 80-90 instrumentalists plus choir. AV: What’s your favorite Star Wars: Galaxy Of Adventures episode? RS: I have so many favorite episodes and moments, and so it’s difficult to single out just a few. I really love the episode “Luke vs. 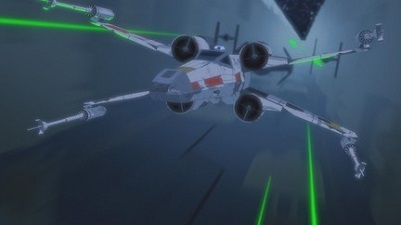 The Death Star X-Wing Assault” because of the way I was able to incorporate The Force theme into a moment which was scored differently in the original film. AV: What’s your best memories of that experience? RS: It’s always a thrill when there is an opportunity to rethink an iconic moment in a new musical way which resonates. With special thanks to Ryan Shore and Jordan von Netzer. The post Annecy: U.S. Studio Presence Grows With Premieres And Work-In-Progress Sessions appeared first on Cartoon Brew. The post For Latin American Creators, It’s About Telling Stories That Matter To Them appeared first on Cartoon Brew. The post Short Pick Of The Day: ‘Hot Tea’ by Marcel Tigchelaar appeared first on Cartoon Brew. The post WATCH: Marta Pajek On Making The Short Film Trilogy ‘Impossible Figures’ appeared first on Cartoon Brew. The post Short Pick Of The Day: ‘The Tesla World Light’ by Matthew Rankin appeared first on Cartoon Brew.